Please be advised that as a result of the labour disruption the Roncesvalles meeting will be cancelled this Saturday. I apologize for the late notice and the inconvenience. Toronto civic employee unions will be in a legal position to strike at 12:01 am Monday. City negotiators are still bargaining with the unions and want to reach a negotiated settlement. If there is a strike the City will maintain some services, reduce others and close some services. Please look at the listings below to see how you will be affected. Please also share the information with friends and neighbours so that they can make any arrangements they need to make. If there is a strike I will not be able to offer my constituency office in the Parkdale Library and my staff and I will not be working at City Hall. We will be checking email and telephone messages constantly and responding to your need and concerns. I am sure you share my hope that a settlement is reached. Please be advised that staff will be hosting a public meeting to get advice on the detailed design elements of the Roncesvalles Reconstruction project. Attached are the public notices, in English and Polish, that are going to be delivered to folks in the neighbourhood this week. 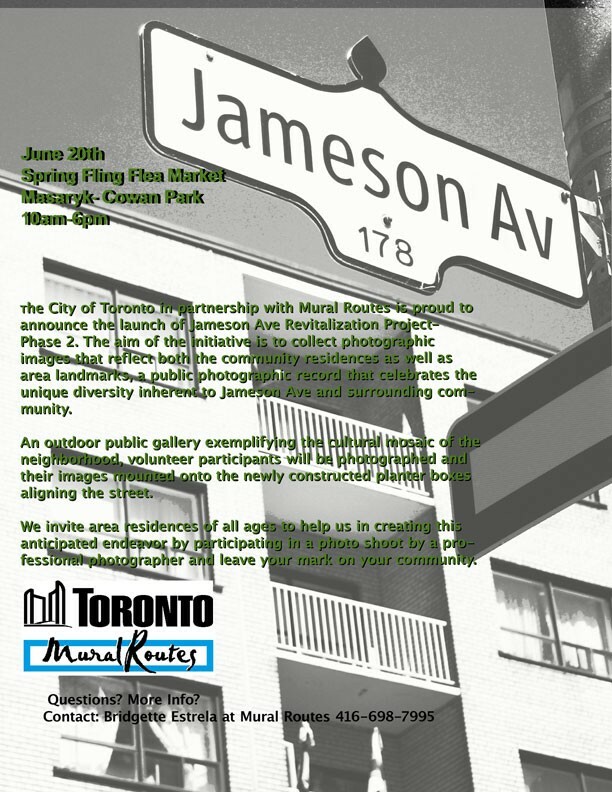 The city of Toronto in partnership with Mural routes is going to launch phase two of the Jameson Revitalization project this weekend. Please join us at Masaryk Cowan Park and record the diversity of Jameson Ave.
You are invited to a Public Presentation of Preferred Green Building Design Concepts for a Future Recreation Centre at 40 Wabash Avenue and a Master Plan for Sorauren Park. Parkdale Spring Fling – Saturday, June 20. There are events from 9:00 AM until 10:00 PM. outside of No Frills supermarket, 1435 King St W.
from 11:00 AM to 3:00 PM (every hour on the hour) at Queen St W.
& Elm Grove Ave (the South West corner). event in front of the Parkdale Library from 10:00 AM to 4:00 PM. Come and discover Parkdale. See you at the Fling! There is an upcoming Fundraising concert for the food bank on Saturday June 27 at 8:30 P.M. at Hugh’s Room, 2261 Dundas Street West, South of Bloor, 416-531-6604. It will be a fantastic concert with six bands that will run from 8:30 until closing. Tickets are $16 in advance and $20 at the door. This post is a little tardy, but I would like to take this opportunity to thank the residents of Edna, the West Bend Residents’ Association, the TTC and the City for helping to make a beautiful linear garden along the north side of the Dundas West Subway station. 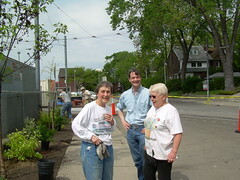 I had a lot of fun planting and visiting with folks and look forward to watching the garden grow! a Master Plan for Sorauren Park on Tuesday, June 23: 7:30 to 9:30 p.m.
Hey Ward 14! Are you ready for a little friendly competition this summer? If so, here is your chance! Created by Toronto Hydro, the Count Me In Toronto challenge is a new engaging and unique way to encourage electricity conservation in the City of Toronto. The program will see Toronto‘s wards competing against one another in a friendly competition. The greenest ward at the end of the summer will receive a $5,000 efficient retrofit (such as a lighting upgrade, solar water heater, landscaping and/or outdoor lighting) to a landmark building. For more information on how to participate in the challenge as well a helpful list of programs, visit www.countmeintoronto.ca today! You can also us the website to register for the challenge online. Just for registering, you’re entered to win one of five MacBooks! On the afternoon of Tuesday, June 23, Students from Room 412 of Queen Victoria Public School will be running a charity car wash in front of the school , on Close Avenue, east of Jameson, south of King St. They are hoping to raise money for the children’s book section of the Parkdale Public Library. The students have been visiting the library throughout the year, and would like to give something back. The money raised will go directly into books for the kid’s section, with a sticker inside to say how the book was purchased. The car wash will be running from approximately 1:00 to 2:30. A car wash will cost $5.00.